Hello Friends! I am so happy to be a part of the blog tour for Etno, Pat Bravo’s new line from Art Gallery Fabrics. When Pat put out the call on her Instagram account looking for people to participate I happened to be up doing a middle of the night baby feeding. Immediately I sent an e-mail saying I would love to be involved! I was thrilled when I found out I was selected. I am a big fan of Art Gallery fabrics and I’ve used them for many of my sewing projects. There are so many amazing prints to choose from and the fabrics are great quality. I was provided with a gorgeous voile, called Shore Remains Algae, to make the Zsalya Top from Kate and Rose patterns. I have been wanting to make this top for a while and I am so happy with how it turned out. 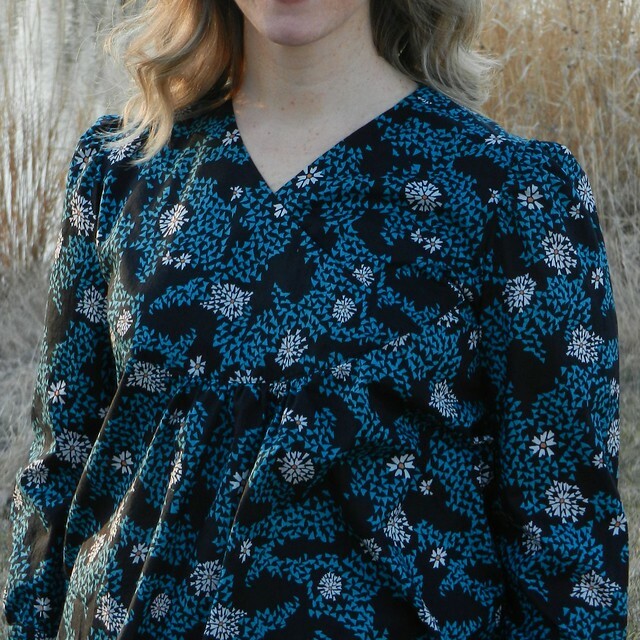 This flowy top has a unique crossover neckline with curved yokes in the front and back. 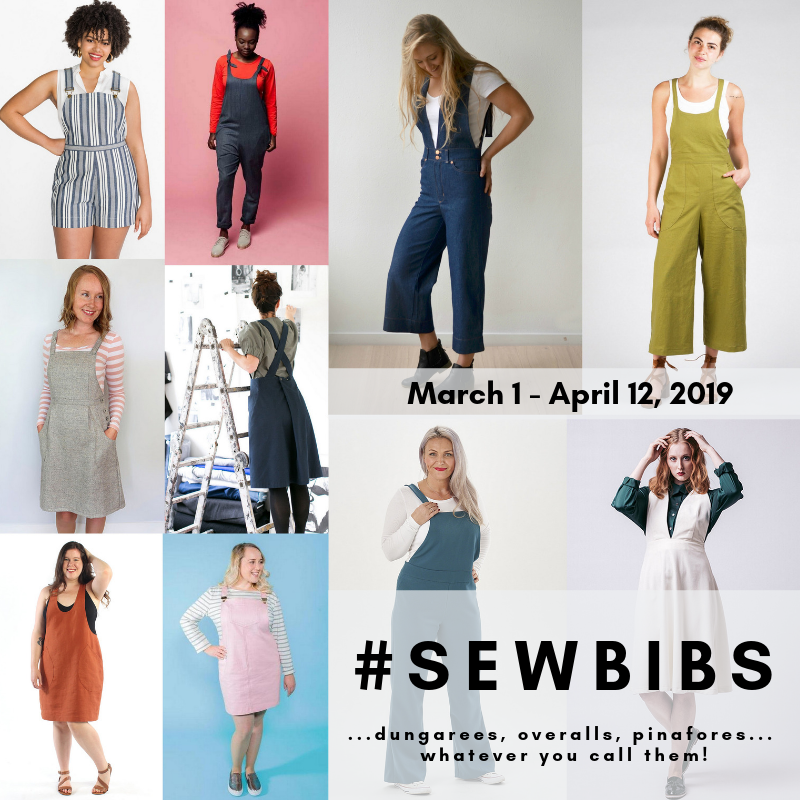 There is an option for short or three-quarter sleeves, and I chose to make the longer length. I love how the cuff is curved to mimic the crossover neck. The voile is the perfect weight for a top like this– it has just the right amount of drape for the gathering in the center front and back of the bodice. I made a muslin to check the sizing of the top since there weren’t finished measurements given in the pattern. My bust measurement fell between the size medium and large, so I ended up cutting right in between those two sizes. I felt like the shirt was a little big, but not big enough that I could size down to the medium. 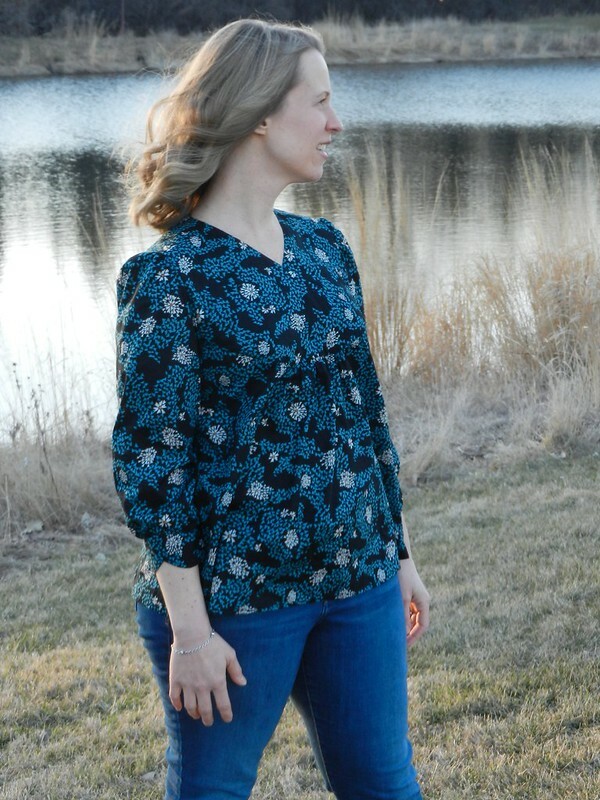 The pattern calls for 3/8″ seam allowances, but I decided to sew the final top with 1/2″ seams. This brought it in just enough that it fits better, but is still relaxed and flowy. When I received my fabric I was suprised to find that half yard cuts of two Etno quilting cottons were included. Instead of stashing them away for later I decided to make a few quick, fun projects with them. 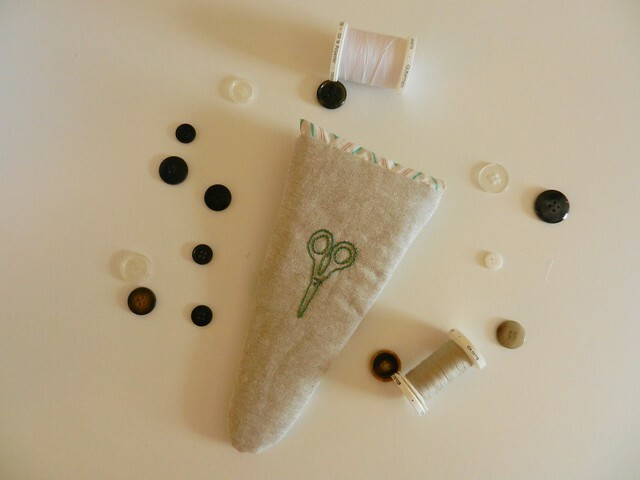 The first is this Scissors Keeper from the book Make It, Take It by Krista Hannebury. I used the Etno fabric called Angle Inception Polar for the lining and the front pocket. My main fabric was a plain linen/cotton blend and I embroidered a pair of scissors on the back to spruce it up a little bit. 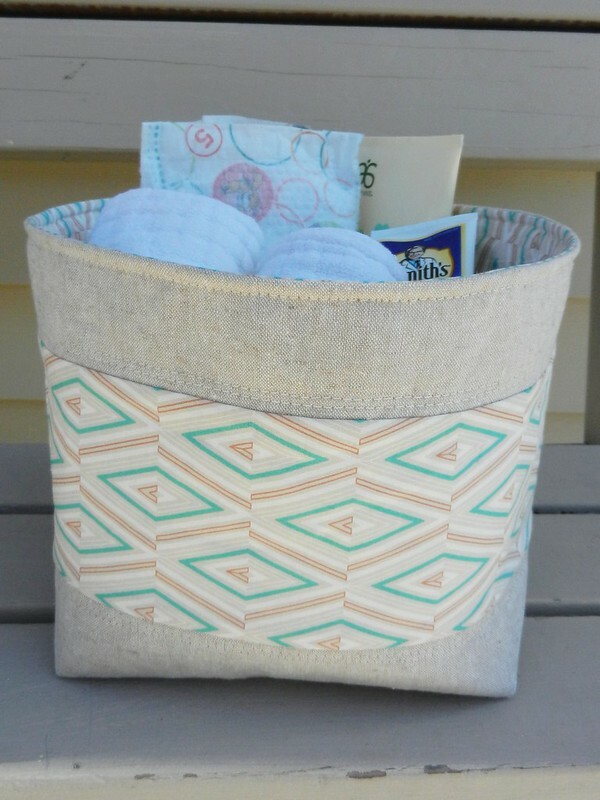 I used the same two fabrics to make a storage bowl from this great pattern available at A Cuppa and A Catchup. This is being used for a little diaper changing station in our family room. 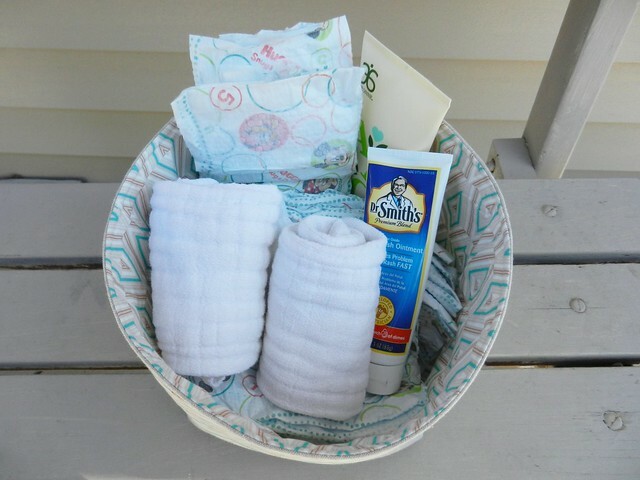 I know I will be making more of these pretty bowls for storing things around the house. I think my favorite project turned out to be this adorable bib and bonnet set I made for my 7 week old daughter, Caroline. 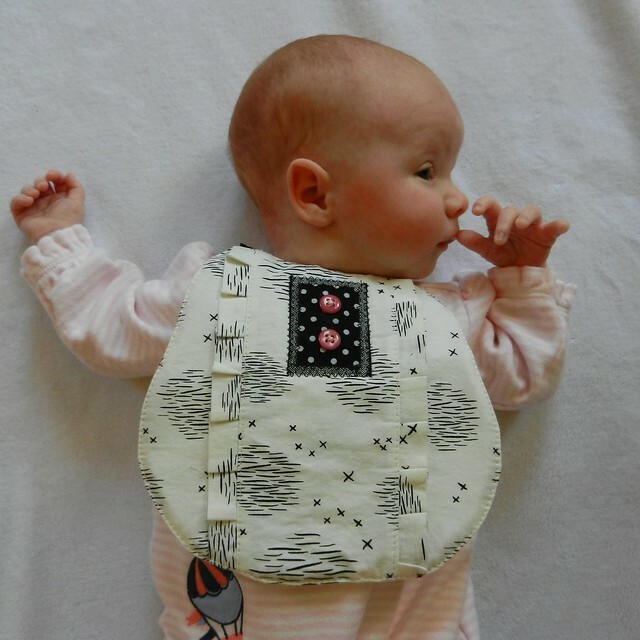 The bib is a free pattern from Nana Company and the bonnet is a free pattern from Purl Soho. This quilting cotton called Sauvage Sky Artic was perfect for these two sweet patterns and it paired nicely with a polka dotted fabric that I had in my stash. All she needs now is a coordinating dress and I may die of cuteness. Thanks so much for having me as part of your blog tour, Pat! I had so much fun working with these lovely fabrics. Ooh how I love your projects!!! They’re beautiful! Thank you, Miki! I loved making all of them. Thanks, Pat! Your fabrics are so fun to work with! Darling bonnet and the ruffles on the bib are too cute. Thanks, Vicki! I love the ruffles on the bib, too. Oh my goodness your daughter is adorable! I love the top you made. I definitely want to make something out of that voile. I love the print so much. Thanks, Hilary! It’s such dreamy fabric. I’m excited to see what you make– your sneak peeks look amazing! Thanks, Tracy! The yoke of the blouse is lined but the rest isn’t. The fabric is a bit sheer but since it’s a dark color I was able to get away with not lining it. If it was a lighter background I probably would have lined it. I love that top on you Teri – and that colour looks fantastic. I’m really digging that print! I love you little projects too! You’ve been so busy! Sorry love *your* little projects too! Oops! Thanks, Heather! Sewing keeps me sane in the chaos here so I try to squeeze it in where ever I can! Thanks, Lisa! I love seeing for my two boys but it’s so much fun to make tiny girl things! So many lovely things to scroll through in this post Teri! Your top is great, and as you say looks perfect with jeans. 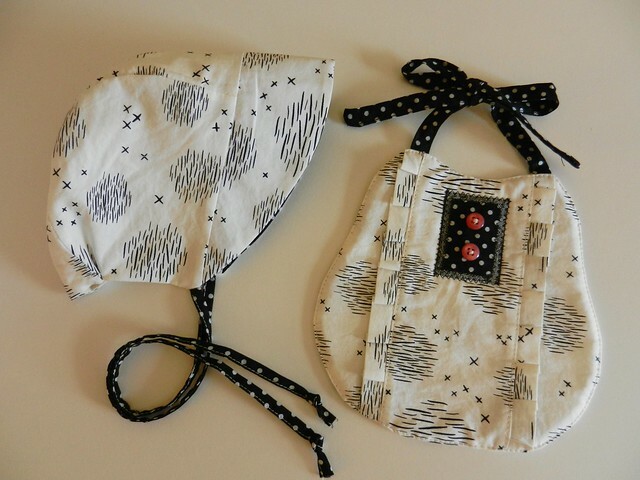 Those containers look really useful and your daughter looks adorable in her new bonnet and bib set 🙂 I’m amazed you’re finding all this time to sew. Is she a good sleeper? She really is a good sleeper! I don’t know how but she sleeps through all of the noise that the boys make. I usually have some time to sew in the afternoon when she and Andrew are both napping. Thank you so much, Debbie! We think she’s pretty adorable! Oh wow, that fabric is soooooo pretty!! Seriously! I gotta stop reading blogs all the time because it is really not helping with my budget (not your fault that I have no self-control!). I love all of these projects, but man, BONNETS. 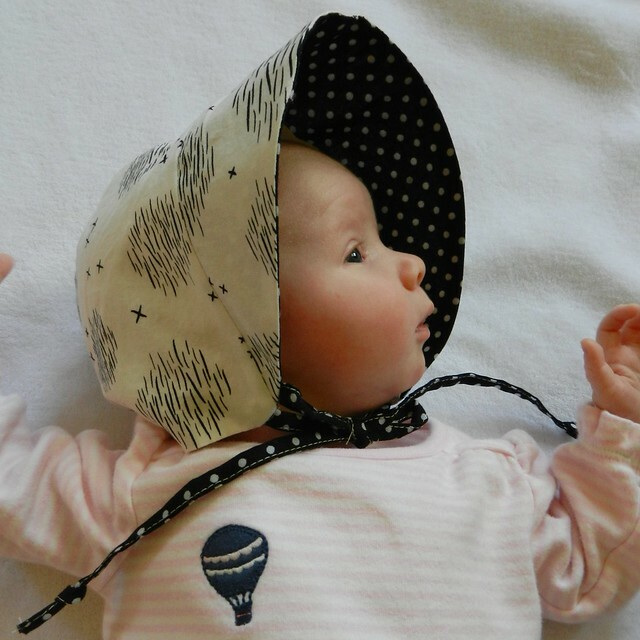 I don’t know what it is about a baby in a bonnet, except BONNNNNNNNNNET. She’s beautiful and such lovely sewing, mama! Thanks, Inder! I am going to keep making her bonnets until her head is too big for the pattern. I love them so much! Your blouse is really beautiful – I am becoming seriously addicted to AGF voile, it is such a dreamy fabric!! I am so excited to be apart of this blog tour and so happy to meet new friends through it! Thank you so much! 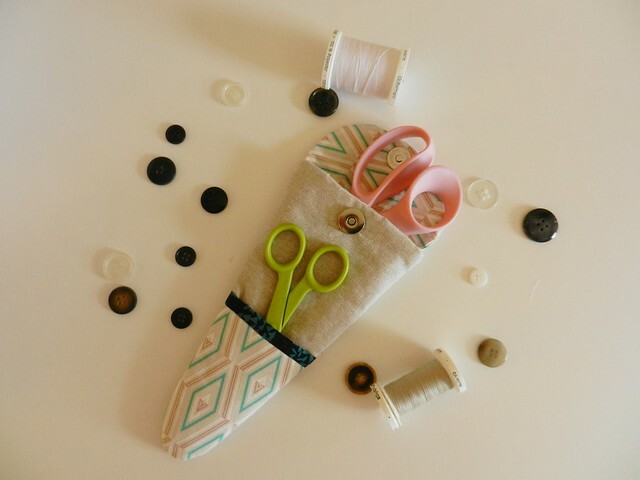 The fabrics are so nice to work with– I really loved making all of these things! These are really awesome, I am loving and learning along this hop! Thank you! Oh, good, I’m so glad! There have been so many pretty things created for the tour!